The other day I came across an article posted on the popular tech site, CNET, titled the “21 shortcuts for Safari you should know.” As you probably can guess, it includes the best keyboard shortcuts for controlling and managing features in Safari. Well, I have a challenge to this article. While shortcuts are great, who can actually reminder them all? And furthermore, if your hand is already on your trackpad or mouse while browsing Safari, why move your fingers back to your keyboard in order to press hotkeys? 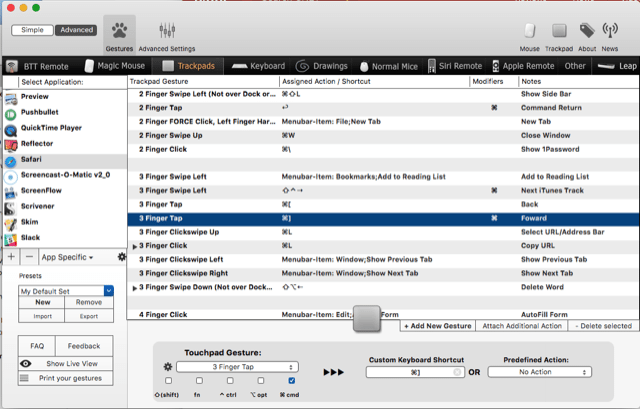 So you know me, I suggest the more effective and powerful BetterTouchTool for triggering keyboard shortcuts and getting these same actions done faster. To jump back and forth between in the current tab, I use 3 Finger Tap [triggers Command+Left Bracket key] to go back a page, and a 3 Finger Tap+Command [Command+Right Bracket key] to forward in a tab. I pinch in with my thumb and index finger to zoom in on a page, and pinch out with the same finger to zoom out on a page. To trigger the Show Previous Tab and Show Next Tab menu items, I do a 3 Finger Clickswipe Left and the 3 Finger ClickSwipe Right, respectfully. I do a 3-Finger Click (Command-L) to select the URL bar. But because most of the time when I select the URL bar I’m wanting to actually copy the URL, I have this gesture also trigger the Command+Shift+4 keys to copy the URL. 3 Finger Click select the URL and copies it. To trigger Command+R, I do a Pinch With Thumb and 2 Fingers. I do a 3 Finger Swipe Left to trigger the “Add to Reading List” menu item. I use this a lot, and I easily remember it because I know that the Reading List is on the left side of Safari. To quickly show the Side Bar, I do a 2 Finger Swipe Left which triggers the Command+Shift+L keys. To close a tab I use a TipTap Left (2 Fingers Fix) to trigger the Command-W.
To show the Safari history, I do a 5 Finger FORCE Click on my trackpad, which triggers the Command-Y shortcut. 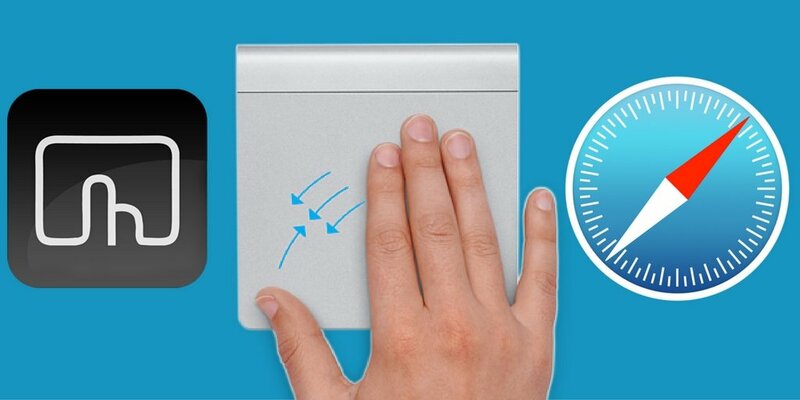 Note, the force click only works with Apple’s force click trackpad. To show all tabs, I do a 5 Finger Tap, which triggers the Show Top Sites menu item. To quickly hide Safari, I use a 5 Finger Tap+Command. To hide other applications, I just use 5 Finger Tap. To do an auto fill, I use a 4 Finger Click to trigger the AutoFill Form menu item. I have the WordPress editor pinned as the first tab of Safari. To quickly get back to that tab from within any application, I use a global 4 Finger Swipe Left, which triggers a Keyboard Maestro macro that selects the first of the frontmost Safari window, or if the Safari window is behind another application, the macro will activate Safari and then select the first tab. When I want to paste the URL of the frontmost Safari window, I use a global 3 Finger Click+Command. Because it’s a global gesture, I can use it from within any application. The gesture triggers a Keyboard Maestro URL macro, which means I don’t have to copy the URL first in order to paste it. Traditionally punching shortcuts is considered the fastest way to trigger menu items on the Mac, but with BetterTouchTool that’s no longer the case. If your hand is already on your trackpad, there’s no reason to move it back to your keyboard in order to press a set of keys. If you’ve never used finger gestures, the above examples may appear to be difficult to remember. But in actuality, they are not as remembering shortcuts. Plus, with shortcuts, most people, including me, have to often look down their keyboard to locate the modification keys. This is not the case with finger gestures. 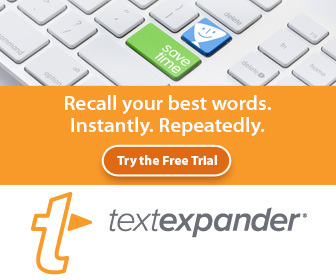 The more you use them, the easier they are to remember. BTT gestures also work in Google Chrome or Firefox, and you can set up unique gestures for each of the browsers. @macautotips Love this BTT tool, only just got it after I subscribed to your newsletter. Magic !!! 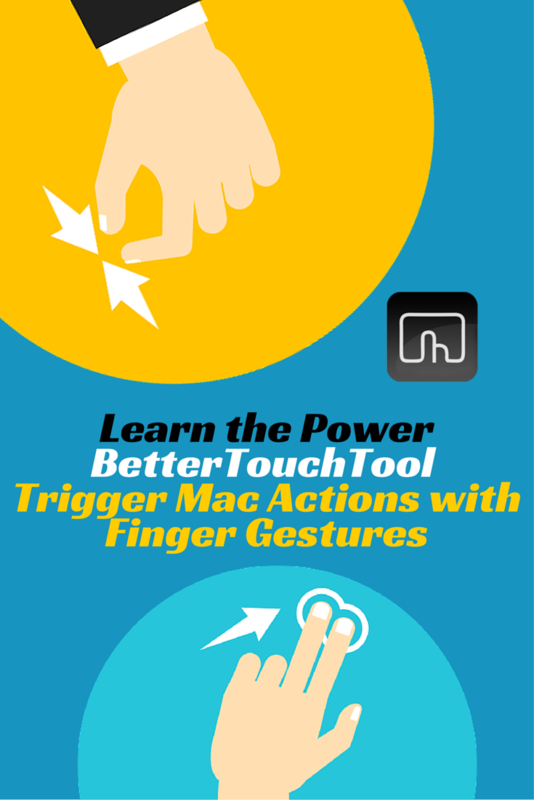 BetterTouchTool is a free download, and the full price has a pay what you want price tag starting at $6.50. I also have online course that shows you have to set up BTT and learn all its features. The course includes 13 videos and 11 PDF guides. 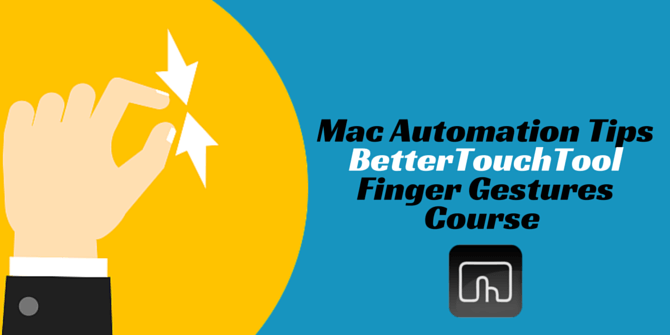 These instructional resources will save you time in learning BetterTouchTool, and help you maximize all its features. Superb article. I used to think keyboard shortcuts were great but BTT makes things even better/easier once you take the time to learn (use) them. Just had a rethink of my Safari gestures thanks to your article. Hey Michael, thanks for the feedback. Since I started using BTT I hardly ever type shortcuts. It’s awesome to visit this website and reading the views of all mates on the topic of this article, while I am also keen of getting know-how. Thanks for your feedback. Keep in touch, and happy holidays.